From bronze sculptures to ranch tools and equipment, the Cattle Raisers Museum’s artifacts collection chronicles the history of TSCRA and the cattle industry. The Museum is dedicated to preserving these objects and their stories for generations to come. For additional information regarding artifacts in the Museum’s collection, please contact our Collections Manager at hbaker@cowgirl.net or 817-509-8663. 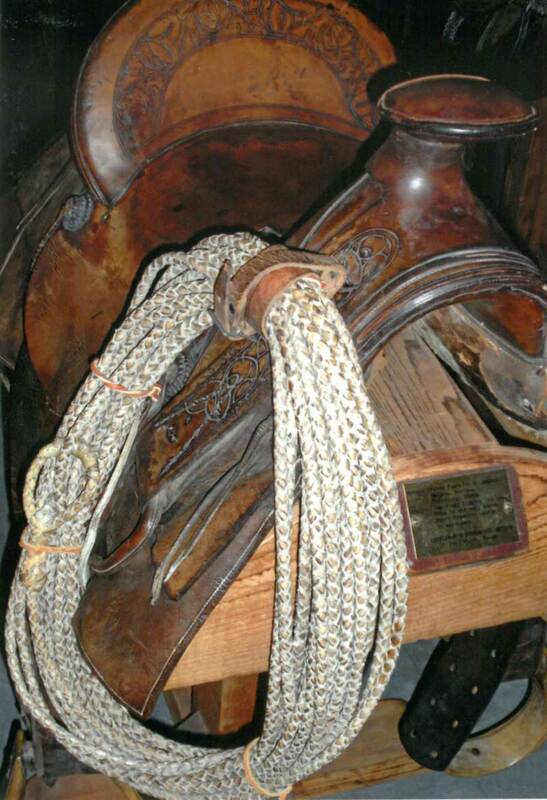 In 1992, the Cattle Raisers Museum acquired 14 saddles collected by Ken Spain of Aledo, Texas. Dating from the 1850s to the 1920s, the saddle styles vary from a half seat to a full seat, loop seat, and double and single rigging. The collection contains the F. A. Meanea saddle, which was among the first fully tooled saddles with matching bags, as well as a saddle from the 1870s by well-known maker J.S. Collins. The collection also contains the only known saddle by Helena, Montana, maker Peter Franklin, and a Miles City, Montana, saddle recognized as one of the finest in existence today. The acquisition of this magnificent saddle collection was made possible by a partial donation by Ken Spain and by a grant from the G. Rollie White Trust of Fort Worth. Purchased from retired San Angelo rancher Joe Russell, this collection of 52 pairs of spurs includes works of artistic distinction and historical interest. Oscar Crockett, P. M. Kelly, and J. R. McChesney, the big three Texas-style spur makers, are well represented. The collection also contains eastern spur producers like the August Buermann Manufacturing Company, famous for the inexpensive and ubiquitous “O.K” style spurs. Hand-forged spurs, made by individual Texas craftsmen, are also highlighted. One pair of brass spurs, made in the King Ranch blacksmith shop, was worn by a cowboy in the 1930s. The Cattle Raisers Museum acquired this outstanding spur collection with support from the G. Rollie White Foundation Trust in 1996. In 1989, Leonard Stiles, former Texas and Southwestern Cattle Raisers Association brand inspector, presented 1,014 branding irons to the Cattle Raisers Museum. While the sheer numbers are impressive, it is Stiles’ meticulous documentation that makes this branding iron collection exceptional. Stiles recorded how he acquired each iron, the ranch that registered the iron, and the dates each was in use. The Stiles collection includes historically significant irons like the Spanish brand that belonged to Stephen F. Austin; the 1819 J Cross W brand, the oldest iron continually used by a single Texas family; plus branding irons registered by celebrity ranchers such as Nolan Ryan (former Texas Rangers pitcher), Lee Roy Jordan and Chuck Howley (former Dallas Cowboys linebackers), and actor John Wayne.